His recent book, Radical Abundance: How a Revolution in Nanotechnology Will Change Civilization, includes a fascinating explanation of the difference between science and engineering. At first glance, scientific inquiry and engineering design can seem the same. One important distinction, however, results from the flow of information. The essence of science is inquiry; the essence of engineering is design. Scientific inquiry expands the scope of human perception and understanding; engineering design expands the scope of human plans and results. Inquiry and design are perfectly distinct as concepts, but often interwoven in practice, whether within a field, a research program, a development team, or a single creative mind. Meshing design with inquiry can be as vital as hand-eye coordination. Engineering new instruments enables inquiry, while scientific inquiry can enable design. Chemical engineers investigate chemical systems, testing combinations of reactants, temperature, pressure, and time in search of conditions that maximize product yield; they may undertake inquiries every day, yet in the end their experiments support engineering design and analysis. Conversely, experimental physicists undertake engineering when they develop machines like the Large Hadron Collider. With its tunnels, vacuum systems, superconducting magnets, and ten-thousand-ton particle detectors, this machine demanded engineering design on a grand scale, yet all as part of a program of scientific inquiry. But the close, interweaving links between scientific inquiry and engineering design can obscure how deeply they differ. While interacting with the same physical world, the way you look at the problem — through the lens of design or inquiry — shapes what you see. Scientific inquiry builds knowledge from bottom to top, from the ground of the physical world to the heights of well-tested theories, which is to say, to general, abstract models of how the world works. The resulting structure can be divided into three levels linked by two bridges. At the ground level, we find physical things of interest to science, things like grasses and grazing herds on the African savannah, galaxies and gas clouds seen across cosmological time, and ordered electronic phases that emerge within a thousandth of a degree of absolute zero. On the bridge to the level above, physical things become objects of study through human perception, extended by instruments like radio telescopes, magnetometers, and binoculars, yielding results to be recorded and shared, extending human knowledge. Observations bring information across the first bridge, from physical things to the realm of symbols and thought. On the bridge to the top level of this sketch of science, concrete descriptions drive the evolution of theories, first by suggesting ideas about how the world works, and then by enabling tests of those ideas through an intellectual form of natural selection. As theories compete for attention and use, the winning traits include simplicity, breadth, and precision, as well as the breadth and precision of observational tests— and how well theory and data agree, of course. Newtonian mechanics serves as the standard example. Its breadth embraces every mass, force, and motion, while its precision is mathematically exact. This breadth and precision are the source of both its power in practice and its failure as an ultimate theory. Newton’s Laws make precise predictions for motions at any speed, enabling precise observations to reveal their flaws. Through observation and study, physical systems shape concrete descriptions. By suggeting ideas and then testing them, concrete descriptions shape scientific theories. 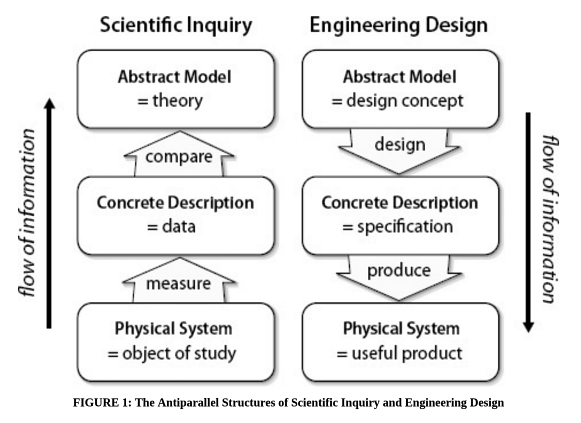 Here is a schematic structure of Scientific inquiry contrasted with the structure of engineering design. Inquiry extracts information through instruments; design applies information through tools. Inquiry shapes its descriptions to fit the physical world; design shapes the physical world to fit its descriptions. At this level, the contrasts are often as concrete as the difference between a microscope in an academic laboratory and a milling machine on a factory floor. At the higher more abstract levels of science and engineering, the differences are less concrete, yet at least as profound. Here, the contrasts are between designs and theories, intangible yet different products of the mind. Scientists seek unique, correct theories, and if several theories seem plausible, all but one must be wrong, while engineers seek options for working designs, and if several options will work, success is assured. Scientists seek theories that apply across the widest possible range (the Standard Model applies to everything), while engineers seek concepts well-suited to particular domains (liquid-cooled nozzles for engines in liquid-fueled rockets). Scientists seek theories that make precise, hence brittle predictions (like Newton’s), while engineers seek designs that provide a robust margin of safety. In science a single failed prediction can disprove a theory, no matter how many previous tests it has passed, while in engineering one successful design can validate a concept, no matter how many previous versions have failed. The key to understanding engineering at the systems level— the architectural level— is to understand how abstract engineering choices can be grounded in concrete facts about the physical world. And a key to this, in turn, is to understand how engineers can design systems that are beyond their full comprehension. Because science and engineering face opposite directions, they ask different questions. Scientific inquiry faces toward the unknown, and this shapes the structure of scientific thought; although scientists apply established knowledge, the purpose of science demands that they look beyond it. Engineering design, by contrast, shuns the unknown. In their work, engineers seek established knowledge and apply it in hopes of avoiding surprises. In engineering, the fewer experiments, the better. Inquiry and design call for different patterns of thought, patterns that can clash. In considering the science in the area around an engineering problem, a scientist may see endless unknowns and assume that scarce knowledge will preclude engineering, while an engineer considering the very same problem and body of knowledge may find ample knowledge to do the job.